For decades dental crowns were primarily made of metal, which could cause otherwise beautiful smiles to seem unsightly. But modern crowns are more beautiful and long lasting than their predecessors, making them an ideal form of restorative treatment for many patients, and in a variety of dental situations. Whether you’ve recently had a cavity filled, have a root canal scheduled, or unexpectedly lost a tooth, you might be surprised the many ways dental crowns can help restore or complete your smile. What can a crown help address? Crowns can be used to help teeth affected by a number of dental problems. In some cases they may be used to further protect a tooth after a cavity has been filled, or to cover a chip or crack. They’re also frequently used after root canal treatment to help seal the area and prevent reinfection. 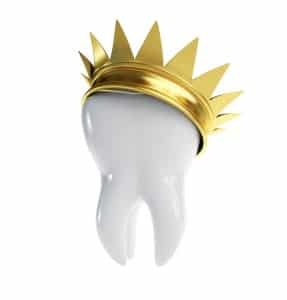 Crowns can also be used to help complete a smile after tooth loss, particularly when part of a dental bridge or dental implant. What are crowns made of? Many modern dental crowns are made of porcelain, because of its strength and its beauty. Porcelain can be crafted to match a patient’s natural teeth, from their size and shape to their exact shade. And because porcelain is nearly as strong as your natural teeth’s enamel, they will maintain their beauty for many years to come. There are also metal crowns, frequently used for less visible teeth, porcelain-fused-to-metal crowns, and zirconia crowns which are incredibly strong but still natural looking. How long will crowns last? With proper care, including regular dental checkups, crowns can easily last a decade or more. Proper care for a crown includes brushing with a non- abrasive toothpaste, and flossing around the crown, to prevent plaque bacteria from building up.